I'm attempting to create a strongly-typed view based on a class from another assembly. For whatever reason though, my Razor view doesn't seem to have any visibility of other assemblies referenced on my project. e.g. results in the error in Visual Studio 2010, "The type or namespace name MyClasses could not be found (are you missing a using directive or an assembly reference?)." The same class referenced in the standard view engine works fine. I have the same trouble trying to reference the class in the body of my view. Am I missing something about Razor or do I need to reference the assembly some other way? There is a new configuration section that is used to reference namespaces for Razor views. After editing the Web.config, restart Visual Studio to apply the changes. I had the same problem: MVC3 Project MyCore.Web was referencing to MyCore.DBLayer namespace from another project in the same solution (with assembly name MyCoreDBLayer). All objects from MyCore.DBLayer worked perfectly in Controllers and Models but failed in Razor views with an error 'The type or namespace name 'DBLayer' does not exist in the namespace 'MyCore' (are you missing an assembly reference?)' which was obviously not the case. Copy Local option was set to true. Omitting version, culture, token was OK for now, but should be fixed in the future. In my case, the separate project that contained the namespace was a Console Application. Changing it to a Class Library fixed the problem. It was because I had my Build Output going to bin\Debug\ for Debug configuration and bin\Release\ for Release configuations. 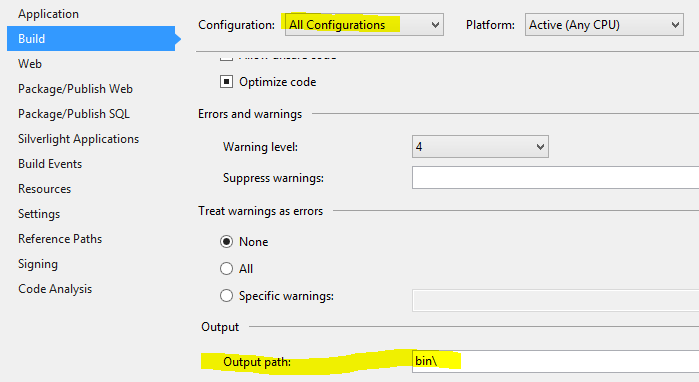 As soon as I changed the Build Configuation to "bin\" for All configuations (as per image below) then everything started working as it should!!! Could not load file or assembly 'System.Web.Helpers, Version=3.0.0.0, Culture=neutral, PublicKeyToken=31bf3856ad364e35' or one of its dependencies. The system cannot find the file specified. This lead me to trying to change the Build Output, as I notice that for all web projects the Build Output seems to always be directly to the bin folder, unlike the default for class libraries, which have both release and debug folders. Save that, then close and reopen the Razor file. If you're using Areas you'll need to do this for each Web.Config in each Area. Visual Studio has gotten buggier over the years so it may require closing the Razor file running a Debug build then reopening the Razor file, or may in the worst require restarting Visual Studio. But ultimately it will present the Razor file to you as though everything in that namespaces list was in @using statements at the top of all your Views. For me I was referencing a project that was a console application. It was set to build as an exe (console application) instead of class library (DLL). When I changed this I was able to see the models from that separate project no problem. In ASP.NET Core MVC the solution is to add a using in _ViewImports.cshtml, instead of putting it web.config in the View folder when working with ASP.NET MVC 5. @using mySolution.ViewModels // <-- Add this, and place your ViewModel (e.g. LoginViewModel) in here. Turns out I had both versions in the GAC. The View web.config referenced v1 but the app was referencing v2. Removed the referenced assemblies and re-added v1. of System.Web.WebPages.Razor, etc. well, for me it was different. I was missing assembly of my console application project with MVC project. So, adding reference was not enough. well this might help someone else. go to root web.config file system.web -> compilation -> add your project reference like this. I also had the same issue, but the problem was with the Target framework of the assembly. The referenced assembly was in .NET Framework 4.6 where the project has set to .NET framework 4.5. Hope this will help to someone who messed up with frameworks. None of these https://stackoverflow.com/a/7597360/808128 do work for me. Even "adding assembly referecene to system.web/compilation/assemblies section of the root web.config file". So the two ways remains for me: 1) to add a public wrap class for my assembly that Razor code can access to this assembly through this wrap; 2) just add assembly logic to a public class in the same assembly where the Razor's code is located. In addition to making the web.config changes for <assemblies> and <namespaces>, I found that GAC'ing the assembly made a big difference. You can apply culture and public key token like any core .NET assembly that is registered globally. Some may shudder at the mention of the GAC. But as a BizTalk developer I've grown to embrace it. Your Project FOLDER name needs to be the same. If your Project or Solution name is different, then MVC will hurt you. Now everything will work, except Razor views. RazorViews cannot find it, because there is some kind of strange dependency on the FOLDERNAME of the project. It is terrible design. I have tested this semi-thoroughly by copying my files into a new solution, and the only difference being the foldername.